Specially designed left and right steel side boards for T7, thickness 8mm, weight 27kgs, bending resist rate is up to 235MPa. It enables machine body bear for maximum 2 tons weight, so as to effectively resist vibration when the carriage is moving fastly, make sure each ink dot drops accurately. Machine Frames Process Main bottom frame was wholly milled by German imported 6 meter planer type milling machine, which error is only less than 0.05mm. Double layer trusses welding, bending resistance is far more better than thin metal bending beam. 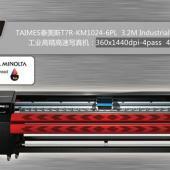 Therefore, TAIMES printers are able to work more stable and long life than other machines.